Timmy Moore is slightly excited after fellow senior and alternate captain Brady Ferguson ties the game with 3 minutes to go. 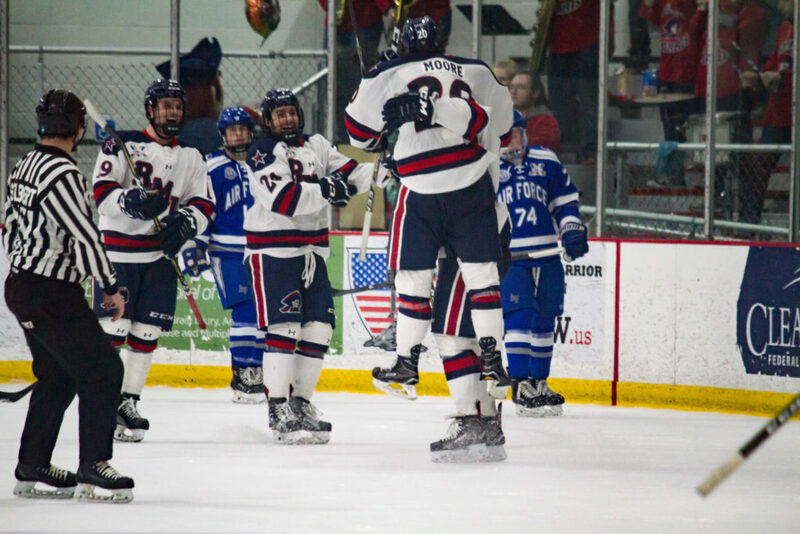 NEVILLE TWP., Pa. — The Robert Morris Colonials closed out their regular season with a 2-2 tie against the Air Force Falcons. Starting the night with a celebration of the class of 2018, the Colonials honored: captain Alex Bontje, Elias Ghantous, alternate captain Brady Ferguson, Spencer Dorowicz, alternate captain Timmy Moore, Robert Powers, Andrew Pikul, and Alex Dagnal. Robert Morris found the net first four minutes into the game with Alex Tonge scoring from Brady Ferguson and Alex Bontje. Air Force struck twice in the second with goals from Phil Boje and Marshall Bowery taking a 2-1 lead. With three minutes left in regulation, Brady Ferguson would tipped a Timmy Moore shot past Billy Christopoulos to tie the game at 2-2. The Colonials finished seventh in the conference, which get them a home series March 2-4 against 10th seed, Bentley. The games will be at 7:05 p.m. at RMU Island Sports Center. Rob Powers mentally prepares himself for the game while sitting on the bench before warm ups. Andrew Pikul warms up with the Colonials on Senior Day. Timmy Moore warms up with the Colonials on Senior Day. Spencer Dorowicz warms up with the Colonials on Senior Day. Alex Robert throws Erich Jaeger to the ice. Kyle Haak flips before falling to the ice after a hit from Dan Mantenuto. Luke Lynch does what Luke Lynch does best, pushing Trevor Stone into the boards after a shoving match. Alex Tonge moves the puck during the second. Phil Boje celebrates along the bench after netting tying the game. Mike Coyne hits Phil Boje during the second. Billy Cristopoulos stops the puck while Nick Prkusic and Alex Dagnal continue to fight. Dan Mantenuto gets pushed to the ice by his face by Erich Jaeger after a faceoff. Pierce Pluemer gives Eric Israel a look during the third. Eric Israel slides while coming around the night. Billy Cristopoulos catches the puck as it flies through the air while Dan Bailey and Luke Lynch battle in front of the net.